Welcome guest poster, Steve Waller of Green Steve. There’s no surer sign of mankind’s failure as the planet’s chief custodian than when a species becomes extinct as a consequence of our activity. Though there are numerous famous examples throughout history of species being wiped out at the hands of humans, we’ve yet to take on the meaning of theses lessons. Today, we continue to threaten bio-diversity in various locations over the world. Here’s a look at just five species that have become extinct in over the last ten years with the help of humans. The ‘baiji’, as the species was commonly known, represented 20,000,000 years of evolution and, although as recently as the 1950’s population numbers where as high as 6,000. By 2007, they were declared extinct after an extensive survey of the Yangtze river, the freshwater dolphins’ natural habitat, failed to find a single living specimen. The extinction marked the first time that a species of megafauna (commonly defined as a creature weighing more than 100 kilograms) had been wiped out since the last Caribbean monk seal died off. (Although they were only placed on the endangered species list in 1967, they’d probably been extinct since the 1952, the last time a sighting was confirmed.) This dolphin’s extinction is one of the most notable extinctions of the century. Although the animal was held in high regard, playing a part in the region’s folklore (the animals were rumoured to be the reincarnation of a drowned princess) they received no adequate protection as China began rapidly industrializing in the second half of the 1950s. 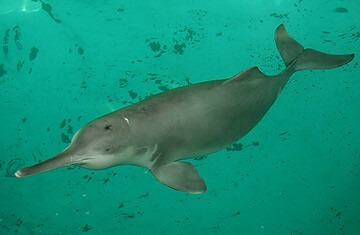 One of only four species of ‘river dolphin’ in the world, the baiji found the Yangtze becoming a more and more inhospitable environment. Accidental deaths from fishing practices were a major problem, with half of all deaths during the 70’s and 80’s being caused by entanglement with nets. Though fishing practices bear a large part of the blame, the inevitable degradation of the Yangtze, which serves as the main waterway for the world’s most populous nation, is widely considered to be a huge contributing factor. The huge increase in ship traffic, pollution and electric fishing all played a part. As well as these ongoing problems, baiji populations also suffered from periods when they were actively hunted, most notably when, under communism, their former religious significance was lost. So far the baiji the only example of a cetacean becoming extinct thanks to human activity, although it may not be the only species exclusive to the river to have recently disappeared. In November last year it was declared that there are no longer any wild black rhinos roaming their natural habitat. Ironically, the high value placed on the animals was key to their extinction, as criminal poachers sought to profit from trading their horns. The horns are valued both as ingredients for medicinal compounds and as trophies. Their scarcity has meant that, at times, rhino horn has been worth more per weight than gold. Unfortunately, as economic rather than environmental issues were the driving force behind the extinction of the west African black sub species, the same threat applies to other types of Rhino. Indeed, just a couple of weeks before the black rhino was declared extinct, the same fate befell the Javan rhino. In some cases, human activity has far reaching consequences. Although it took until this year for the last Pinta Island tortoise to die out, the cause of their extinction can be firmly pinned on the hunting carried out by 19th century fishermen and sailors. Having evolved in isolation without any natural preadators, the giant reptiles provided a very easy (and reportedly delicious) meal for seafarers. The last known specimen, who was given the monkier ‘Lonesome George’, was unable to successfully mate with females of any similar subspecies before he died, aged around 100 years old. Though some of these birds continue to live in captivity, out in the wild they are, to all extents and purposes, extinct. Though reintroduction may still occur, recent efforts have had to be abandoned due to high mortality rates. Much like the baiji, this creature has gone extinct in the wild despite being revered by the local human population. The amphibians lack ear drums and communicate by waving their arms in a kind of semaphore. Though a fungal disease has been the main cause of the animals demise, the fact that people who believe the frog to be lucky often collect them and take them home has compounded the problem. Are there other animals that humans have caused their extinction? In your opinion how has climate change aided to animal extinction? What do you think governments should be doing to prevent such extinctions? Author Bio: Steve Waller is an environmental blogger who has used his mission to reduce his carbon footprint as a launch pad for educating himself (and his readers) on all things green. For more visit his site, GreenSteve, or connect with him on Google Plus. It’s just sad and shocking to hear that these magnificent creatures are just… no more. No doubt. We are heading towards animal extinction. Its really sad to see that so many animals have left us.